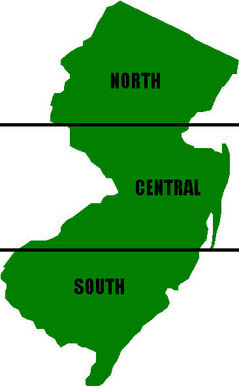 As anyone from New Jersey can tell you, the state is divided into three distinct parts. Growing up, I was a Central Jersey girl. My city was New York, my town was filled with BMWs and Lexuses, and if someone held the door for you after they went through, you were having a good day. I kid, I kid. Sorta. College brought me to South Jersey and I’ve lived here for the better part of twenty years. My city is now Philly (although I do still adore New York, for the record). So when Jenn and Cam told me that they’d like to visit Old City in Philadelphia, I naturally knew all the places to go and what to do. Right? Nope (with a pop of the P). I realized just how lacking I was in the historical department of Philadelphia. I mean, I sort of knew where the Liberty Bell was because I’ve run past in during numerous races. I kind of knew how to get there. I think? Bound and determined, I visited Groupon, knowing that they’d have my back. I get approximately 10 emails a week and I always, without fail, see Philly tours. 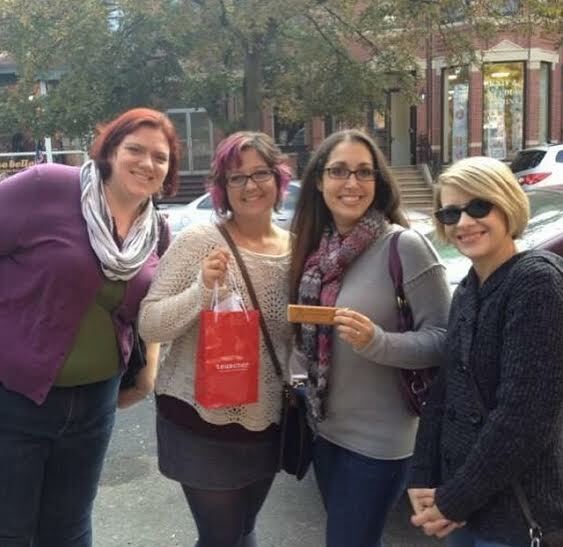 We are not strangers to tours – this was the Boston chocolate tour! When choosing our tour, I considered the audience. Which is us. Which is to say we are loud and like to do our own thing. Having a tour guide and a group wouldn’t be fair to the tour guide or the group. Very loud. And inappropriate. And curse a lot when not near children. 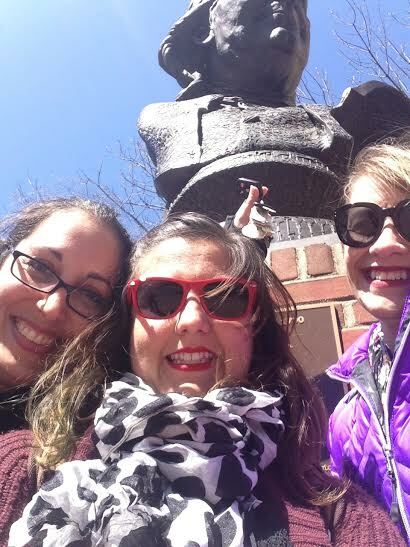 An up the nose (and crotch) shot with a statue on the tour. See? Inappropriate. Stray Boots to the rescue! For an very affordable $8 (thanks Groupon) we purchased a tour of Old City. Stray Boots has 4 Philly tours, as well as tours in cities all the country. The app starts you at point A and brings you on a walking tour around the area of your choice. Ours was about 2 miles and we landed right back at point A. Certain clues (particularly the first one) were a bit tricky for us but they give you a hint, if you ask for it. It’s a scavenger hunt through the destination of your choosing with extra information after each answer so you can learn more history about the location and the people of Philadelphia. One clue was a no-go because the building we were supposed to go into was under construction. However we were able to figure out the clue from a sign on the street and a little Google sleuthing. There’s an option to let the app makers know if something like that has happened. And, of course, there are a couple of questions where you get to interact with people working in gift shops and stores. A tip from us? Don’t just ask them the answer to the scavenger hunt question. They are a fount of knowledge and more than happy to share! Also awesome? Since you’re doing the tour on your own time, you can stop if you want to buy things or have lunch. We walked right past the Continental and doubled back for lunch! We saw at least five properties that we dreamed about owning. We wandered back alleys that reminded me of Spain and listened in on a few of the walking tours that were near us. We behaved ridiculously and made people laugh. Now of course, I’m not going to tell you all the clues, in case you plan on visiting Old City. But I will say this, we all agreed that this was the best $8 we spent! Sorry we cut your head off, Ben. It was the perfect way to spend a day taking in the sights, while still resting before our half marathon the next day. Good times and good friends. Nothing better! Have you ever done a Stray Boots tour or something like it? What is your can’t miss spot in your town? Have you ever been a tourist in your own city? 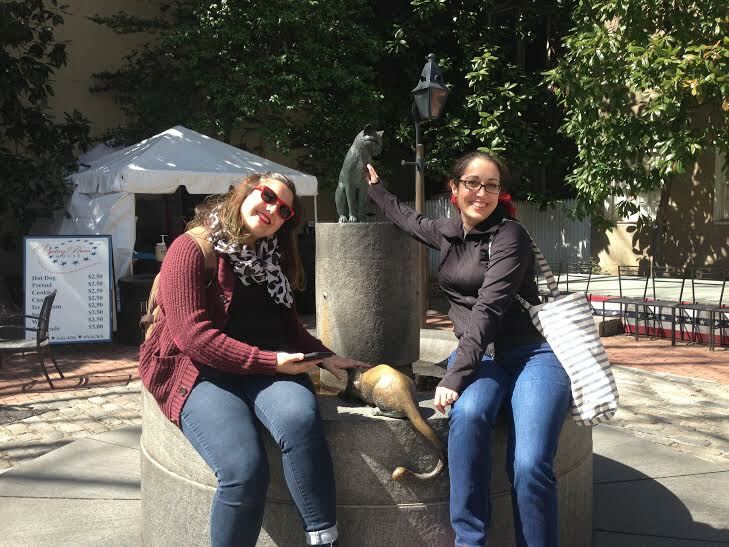 This entry was posted in Fun stuff and tagged friends, fun, old city, philadelphia, stray boots, walking tour. Bookmark the permalink. This was seriously SO much fun. 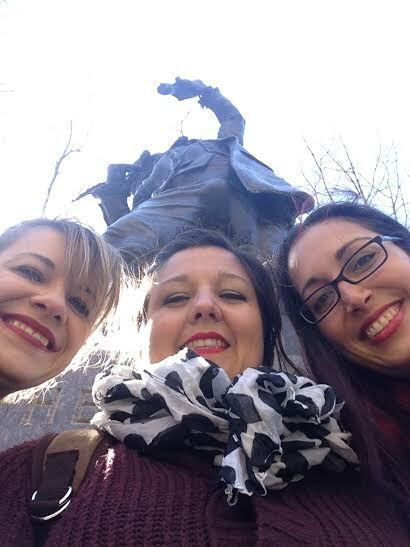 The tour was certainly a good time, and doing it with my girls was a total BLAST! Thanks for taking us, Mer! 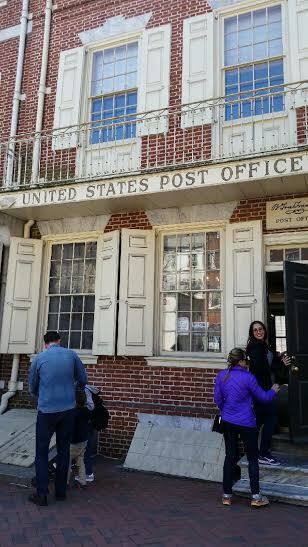 I LOVE Philly….OK only been there once, but I fell in love with the history and Ben Franklin. Its been a few years, but Andy and I just walked and toured the main spots and yeah ran up the Rocky steps too. Its a great city to visit, that tour sounds like a blast. It’s been years since i’ve toured Philly but I remember it being fun. I loved the Franklin Institute. My sister lives in Philly but we don’t often go in the “city” cus it’s so congested and parking is a nightmare. Perhaps we will take the train in next time! There’s actually a Lego exhibit at the Franklin Institute right now that I’m trying to get my family to! Just need a few weekend which feels ever elusive right now, you know? The train is definitely so much easier than driving there. I’m always a nervous wreak when I’m in a car driving around Philly because it’s like you’re driving and then BOOM, there’s a building in the middle of the street. Love Philly for so many reasons and we are way overdue for a trip to visit my husband’s roots again. Especially love Old City as that is where I got engaged(during a tour no less). There is so much history and such to see and do. That sounds like such a fun tour. I vote that you come up here and that we get together and then you just move here so that I can always see you. That works, right? 😉 Seriously though, when you do plan your trip, I hope I can see you! xo Where did you get engaged? Isn’t it funny? 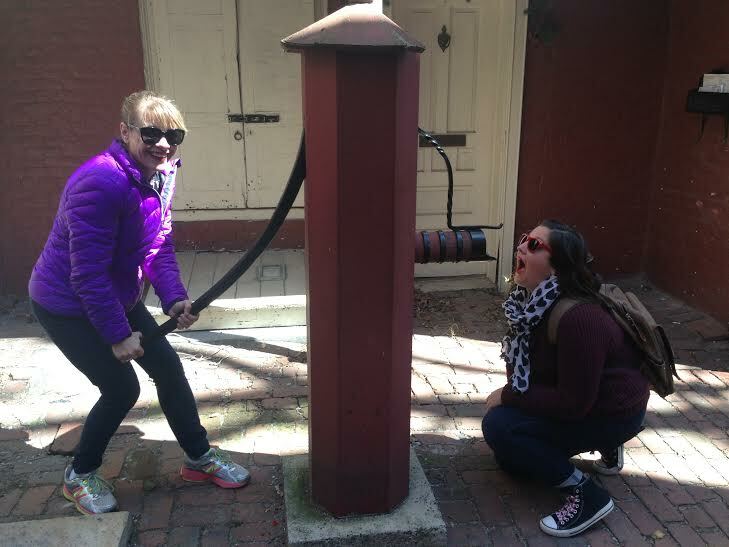 I was telling the girls that we visited the Liberty Bell when I was in 4th grade, I think? And we go to the Philly Zoo all the time. But I never really took the time otherwise (or maybe I just wasn’t interested at the time) to really soak it all in. The Stray Boots app is a lot of fun! Jenn and I were chatting about maybe doing a Denver tour when I’m there next month for BolderBoulder! Are you running? YESSSS, Rachel! 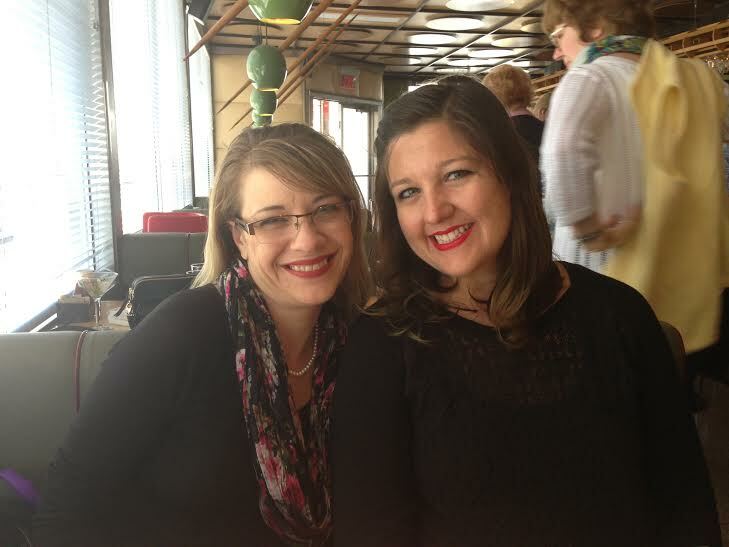 Philly – woot woot! I agree that it’s always better with friends. I’ve done there Chocolate Tour and a food tour in Manayunk which were both great but I like the ease of this app because you can sort of do things at your own pace and go off path if you see something that interests you. Definitely a plus! I loved this post so much!!!!! Old City is my favorite Philly spot and I loved heading over there after work for a drink or some homemade hot fudge at the Franklin Fountain! I so want to do this next time I’m home for a visit!